Android Central Digital Offers is giving away the One Plus 5. You can enter by clicking this link. I get an additional entry every time someone enters the contest! Once you enter, you will get your own link to share with others to obtain additional entries! Get luck! Most cars, trucks, and SUVs come with the latest technology which allows one to pair a phone with the bluetooth technology to listen to audio. In addition to bluetooth technology in vehicles, most cars come equipped with an AUX/USB port that will also allow one to listen to audio in the vehicle. But what if you don’t have any of that technology in your vehicle? That’s where the AGPtek Wireless Bluetooth Transmitter comes into play. It allows you to insert the bluetooth transmitter into the cigarette lighter of your car. Once inserted, the bluetooth transmitter can be paired with a bluetooth enabled device and one can listen to audio in your vehicle. The design of the transmitter is what I liked most about it. Some transmitters have pieces that can easily come apart. With this transmitter it is one piece and durable. I’ll see what happens over time, but I do expect to be using this for a while (unless I trade my car in in a few months). The ability to play music via USB and micro SD is huge. I love the cordless experience but from time to time I want to save the battery on my smartphone. Therefore, having the ability to use the USB connection is nice. In addition, having the micro SD option isn’t bad either. With the price of a 16GB being inexpensive these days, you could easily load up all your favorite MP3 tunes to it and play music that way without even having to use your phone. The output of the sound from the transmitter is very nice! You’d think I had a CD player in the car. I like to set my frequency channel at 87.7 since there isn’t a station on the channel. It makes for a very quality sound experience. My previous transmitters would bleed into other stations and the sound quality was less enjoyable. Now to what I didn’t like. In my video review, I had a hard time changing the tracks. After tinkering with the transmitter on daily commutes I was able to finally change from track to track. Maybe I wasn’t pressing the button correctly since I was using one hand and trying to video at the same time. At the time of the video review, I was pondering on why I couldn’t change the tracks. That’s since changed (since this morning) because I was successful in switching between the previous and next track. When I tested the built in microphone, the recipient on the other end of the phone (my wife) would tell me it seemed like I was far away and in some cases she would continue to say, “hello, hello, hello.” Now, my cigarette lighter is located below the A/C controls so maybe the location of the transmitter may be a factor. I even tried elevating my voice, but the results stayed the same. Would I recommend this product to you? Of course I would. If you are driving an older model car that doesn’t have a CD player or the CD player is not functional, I’ll recommend this to you! For me, I do not need to be able to hold a conversation through my car speakers (although that would be nice). I solely bought this item to replace my older transmitter so I could enjoy music on my commute to work and back home. Most of the quirks I had may have simply been because I didn’t read the instructions (like most men do), but it doesn’t take rocket science to figure out how to use this product. That’s how easy it is to set it up! When RED Digital Cinema announced that they were entering the smartphone industry, they provided limited details. Other than the picture shown above, we didn’t know much about the phone other than its holographic abilities and it’s $1,200 price tag! Read out initial post at your leisure. Yesterday, I was watching Marques Brownlee’s aka MKBHD’s Instagram live. As always, I wanted to see what new device he had to show or what improvements he’d made to his studio. To my surprise, he was uploading a video of his hands-on experience with the RED Hydrogen smartphone device. MKBHD is a huge RED Digital Cinema fan and he shoots most of his footage using RED’s high quality digital video cameras. Therefore, it was fitting to have one of YouTube’s biggest stars and RED Digital Cinema fan to get a chance to shoot footage on the smartphone prototype. MKBHD wasn’t able to give alot if detail, but it definitely was amuch needed video that would give us some type of visual of what the final device will look like. Check out the video from MKBHD, which already has 1.4 million views at the time of this writing. Let me know what you think about this device and if you would buy this device. Oh, and RED Digital Cinema please send us a review unit if you come across this blog post! One can only dream right? I have been waiting on the Note 8 for quite sometime now! I believe Samsung has resolved any battery related issues that plagued the Note 7. 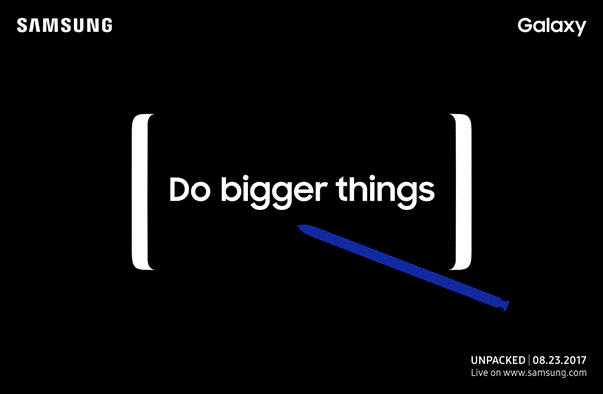 Samsung will introduce the world to the Samsung Galaxy Note 8 on August 23 ar 10:00 CST. The Note 8 is expected to have a 6.3-inch Infinity Display, a Snapdragon 835 processor and 6GB of RAM, along with dual 12MP rear cameras, a 3300mAh battery, an updated S Pen, running Android 7.1. I’m ready for this phone! Are you? Let me know your thoughts. THE WORLD’S FIRST HOLOGRAPHIC MEDIA MACHINE. IN YOUR POCKET. NO GLASSES NEEDED. RED is offering the Hydrogen at two price points, $1,195 for Aluminum build and $1,595 for the more durable Titanium build. Now you maybe wondering why the high price? I thought the same thing. Then I began to think about the quality of cameras that RED builds with digital cameras. Here’s the reasons for the high price tag. I believe that the holographic feature will be like no other. Secondly, with the experience RED has the camera sensors and technology, the phone is bound have one heck of a camera on the smarpthone! I think that the camera sensor technology in the phone will the major reason why the price is high. Who will the phone catch the attention of? I imagine that it will catch the attention of high-profile bloggers, but more importantly photographers. If RED can create a smartphone with a camera with a depth of field that can capture images like DSLR, then they will have a home-run hit. For photographers this will allow them to have a device in their hands that will capture high-quality images without needing to pack around a DSLR camera and bag. Will this totally replace DSLR? No, but smartphone cameras are doing a fairly good job of creating quality images. Another audience this smartphone would cater to is YouTube Creators! I’d use the phone for sure to record my video reviews for products and I’d Vlog a lot more. Think of the capabilities with this phone paired with your favorite smartphone camera rig! This will be a media machine that gives the users the best of both worlds–photography and media! Any Additional Details About the Phone? 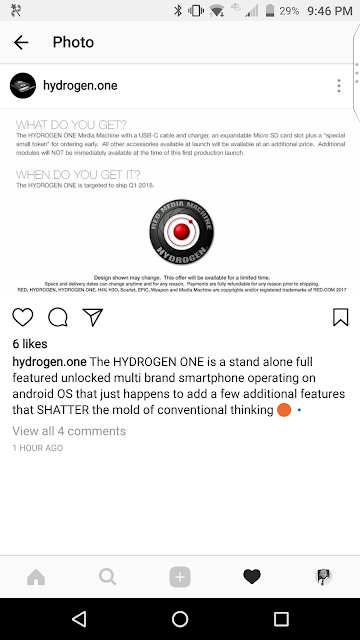 So far the specifications have not been revealed, but the Instagram page I found on Instagram showed a picture of what to expect if you pre-ordered the device. The one thing that stands out to me is the micro-SD slot. Most manufacturers are abandoning the SD storage with the exception of LG and others. So it’s good to see RED thinking about additional storage for those who will be using the smartphone for multimedia purposes. Here are some additional details about what we know about the HYDROGEN smartphone by RED. So what I want to know: Will you be pre-ordering this smartphone? Let us know in the comments!